The growing and collecting of cacti has been a popular hobby in this country for many years. Their varied shapes and colors together with the colored spines make them fascinating and their spectacular flowers are an added interest for the grower. Some of the larger types may not flower in this country owing to the lack of intense sunshine, but many hundreds of other species should flower every year. Some species flower the year after the seed has been sown, while very many more can produce flowers within two years. As the native habitats of these plants are arid regions it is essential that they be allowed all the sunshine possible to enable them to grow at their best. Most cacti come from Mexico and the southern States of the USA, and also from many countries in South America, including Peru, Paraguay, Uruguay, Chile and Brazil. A few are found in the West Indies but none in Africa, India or anywhere in the east. Defining cacti All cacti are succulents but not all succulents are cacti. 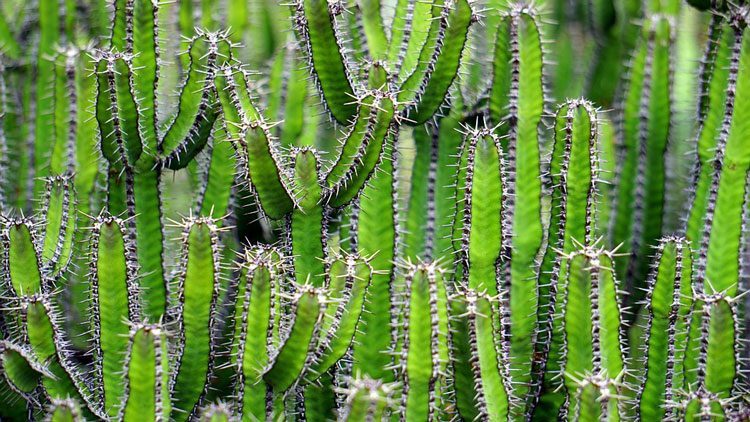 Spines are found on all true cacti and these spines grown from a small tuft of hair or wool. This is known as an areole and no other plant has it. No cacti have leaves except the genus Pereskia. This plant has areoles and leaves and also a multiple flower, unlike true cacti which have a simple or single flower. The flowers of cacti have no stem or stalk, the ovary being connected directly with the plant. Exceptions to this rule are the pereskias. Cacti are often described as desert plants but this is not quite true. Many are found in prairie type country where there may be a few small trees and shrubs with coarse grasses intermingled. Some are found in good loam while others are found growing on rocks and the mountain side. Some of the best flowering cacti, the epiphyllums, grow in the forests of Brazil, usually on trees. Such cacti are classed as epiphytes or epiphytic cacti. As cacti vary so much in size from perhaps 2.5cm (1 in) to 10m (30ft) or more there are many species available to the grower to suit almost any situation or condition. Although the best place to grow a collection of cacti is in a sunny greenhouse, there are many kinds which can be grown quite well in a sunny window. Although all cacti can go for long periods without water, it is essential that they are provided with an adequate supply during the growing period or they cannot flourish. To grow cacti well and flower them it is imperative to provide them with a porous soil as the roots soon rot if they are wet for days on end. Many types of potting soils have been used and recommended, even different ones for each genus; it is possible, however, to grow practically all types of cacti in one kind of potting compost. The art of growing cacti is in the watering and the amount given can vary according to the type of compost. Plants can only obtain their nourishment in a liquid form and so if little water is given the plant cannot obtain too much food. A very good potting compost for cacti may be made up from John Innes potting compost No. 1, to which is added a sixth part of coarse sand to make it more porous. Some additions of broken brick or granulated charcoal may be incorporated in the added sand. If it is desired to mix a compost for general use, the following will be found quite reliable. Take 2 parts of loam, 1 part of peat and 1 part of sharp, coarse sand. Mix well and to each bushel add 21g (3/4oz) of ground chalk or limestone, 21g (3/4 oz) sulphate of potash, 42g (1 1/2 oz) of superphosphate and 42g (1 1/2 oz) of hoof and horn grist. All the globular and columnar types of cacti may be grown in this compost, while for the epiphytes some John Innes potting compost No. 2, may be used, as these plants will benefit from the richer soil. The very spiny types of cacti do not require heavy feeding with fertilizers and as long as they are repotted at least every two years they will grow quite well. If these plants are fed too liberally they will become lush, open in texture, and be very liable to rot off in the winter. Also it will be found that the spines formed when the plant has been fed with fertilizers may not be as stout and well colored as if the plant had been grown harder. When making up the cactus compost it is very important to find a good loam as a basis for the mixture. An ideal type is the top spit from an old-standing meadow. Unfortunately these meadows are becoming few and far between and the loam is often only the under spit after the top turf has been removed. The peat is not so important but the sand must be very sharp and coarse. Silver sand is useless for cactus compost and the type known as washed grit, or river grit is the best. The potting compost should not be used immediately after it has been mixed and a lapse of a fortnight at least is desirable before potting. The time to repot varies considerably, being determined by many factors. Some cacti are very slow growers and so may be left in their pots for two or three years while others may need a move twice a year. Many cacti never flower because they have been in the same stale, worn-out soil for many years. With fairly frequent watering during the growing period the roots of the plant use up the nourishment in the soil, and clearly there can be little food value left in it after about a year. The best time for repotting is during the growing period, which with most cacti will be between March and September. Once new growth is seen on a plant it can be repotted. When dealing with a fairly large collection it will be found better to make a start with the larger pots. These can then be cleaned for use with other plants which may need a bigger pot. It is also a good plan to make a clear place in the greenhouse and place all repotted plants there so that none may be missed. The pots should be clean and well crocked. It is unnecessary to place a large number of crocks in the pot as they will only take up valuable space which would be better occupied by good soil. The best way to crock a pot for a cactus is to cut as large a piece of broken flower pot as will lie in the bottom of the pot. This large crock will then form a kind of platform when the plant is removed the next time. If a stick is pushed up through the drainage hole the crock will force the whole ball of soil up in the pot, whereas if a number of small pieces of crock are used it is possible to damage the roots when trying to remove the plant another time. Place some of the coarsest particles of compost over the crock and then a little soil. Remove the plant from the old pot and hold it by the root system. Gently work all the old soil away from the roots. If any appear dead they should be cutaway. Now rest the plant in the pot and gradually work in some fresh compost. Because most of the plants are spiny it may not be possible to work the soil in with the hands as is possible with ordinary plants. A tablespoon can be used to insert the soil and it can be gently firmed in with an old table-knife handle. A wooden stick must not be used as it would catch in the spines and break them. Once a spine is broken it will never grow again. See that the plant is in the same relative position in the soil as it was before. See also that at least 1cm (1/2 in) of space is left at the top of the pot for watering. The plant should look right in the new pot; do not use one too large so that the plant looks lost or yet one so small that there is no room for soil as well as the base and roots of the plant. For the globular kinds of cacti a pot which is 1cm (1/2 in) bigger all round than the plant will do for pots up to 9cm (3 1/2 in) in diameter, but for a larger plant a pot at least 2.5cm (1 in) larger all round must be provided. This will not be sufficient for many of the taller growing types as the pot must be large enough to form a firm base to stop the plant and pot from falling over. Plastic pots may be used, especially for small plants; they do not appear to dry out as quickly as clay pots. Once the plant is potted it is important to insert the label, and a good plan is to put the date of repotting on the back. This is a useful guide in a large collection. As it is essential that the soil should be able to discharge all surplus water as soon as possible, the pots should not be stood on a flat surface. Some coarse gravel makes an ideal base on which to stand the pots. Any plants stood on shelves must have a saucer containing gravel under them to allow the free removal of surplus water. Watering the plants presents the most important part of cactus culture. More plants are lost through overwatering than from any other cause. As has been stated before, cacti will not grow without water but if they get too much they can soon die. Newly potted cacti should not need watering for about a week. The potting soil should have been crumbly moist at the time of moving the plant. If it is too wet or too dry it cannot be firmed in the correct manner. The whole secret of watering can be described in one sentence. Never water a plant if the soil is still damp. It is not easy to tell when a cactus needs watering. Ordinary plants soon show by drooping leaves when water is required, but cacti cannot show their needs in this way. The condition of the top of the soil will indicate when water is needed. After a hot day the soil may appear dry, but this may only be the top inch. If pots are inspected in the mornings the soil should be of a uniform dampness throughout. Rain water is better than tap water but if rain water is not available let some tap water stand in the open for a day or two before it is used. Water may be given from a can with a small spout so that it can be directed into any pot. Do not water by immersion except for the first watering after the winter. If plants are watered this way often, all the nourishing matter will soon be washed out of the pot. Cacti may be sprayed in the evening of a hot day. No water need be given from the end of September to early March. Then water when the soil has dried out, not before. The Christmas cactus, Zygocactus truncatus, may be watered during the winter as long as the temperature is not below 50°F (10°C). Other cacti may be left at 40°F (8°C), so that they get a winter’s rest. Propagation is by cuttings, taking offsets or by seed raising. Cuttings taken from opuntias and epiphyllums are removed with a sharp knife and the cut part is allowed to dry in the sun. The cuttings are then rested on a mixture of equal parts of peat and sharp sand (not silver sand). Cactus potting compost may be used to fill three quarters of the pot, with the rooting medium on top. Place in a sunny position and spray occasionally. Too much water must not be given until roots have formed. Tall cuttings will have to be supported by a stick, as they must not be pushed into the medium. Grafting may be done to assist the growth of a small, slow-growing type. A tall type is used for the stock, such as Trichocereus spachianus. The top is cut from the stock where the growth is new and healthy. The scion is cut at the base so that it is about the size of the top of the stock. It is brought in contact with the freshly cut stock and kept in position with two small weights on a piece of string, pressing the scion down firmly. Keep in the shade for a week or two and a firm joint will form. Raising cacti from seed Some cacti never make offsets and these have to be raised from seed. A small propagating frame can easily be made and heated with an electric cable or even an electric lamp Half-pots of about 10cm (4in) in diameter are very good for sowing small quantities of seed. They can even be divided with celluloid labels if more than one species is to be sown in the pot. Use John Innes seed compost and sieve a small quantity through a perforated zinc sieve. Place the coarse material over the crock and then top up with ordinary compost, having an inch of the fine soil on top. Small seed must not be buried, but fairly large seeds can be just pushed into the soil. Water the first time by standing in containers of water so that the whole soil can be well moistened. Place in the frame with a piece of glass on top and then cover with dark paper. The best time to sow is in early spring, in a temperature of 70°F (21°C); seeds will germinate at a lower temperature but will take longer to do so. Once seedlings have appeared, the paper must be removed and the glass should be raised slightly. The seedlings must be kept from the direct sun for the first year but they must have plenty of light or they will become drawn. Do not allow the seed pots to dry out while germination is taking place; watering may be done with a fine spray. Prick out when the cotyledon or food-bag has been absorbed. Before this the root is so tiny that it can be broken very easily, in which case the seedling would die. The seedlings may be placed 2.5cm (1 in) apart in the cactus compost as described above. Do not pot up too soon into small pots as these dry out very quickly. Boxes made of concrete or plastic are better for the seedlings until they are ready to go into 5cm (2in) pots. Summer treatment Cacti may be planted out in beds from June to September. If they are removed from their pots it may be quite impossible to put them back in the same sized pots in the late summer or autumn. They may be left in their pots, but the drainage hole must be freed from soil when they are removed. A few cacti may stand the winter out of doors but a very severe winter would probably kill them. If the grower wishes to experiment, he should make sure that any cacti left out during the winter are those which can be parted with, and not specimen plants. All the spiny types of cacti can stand plenty of sunshine as long as there is plenty of air available in a greenhouse. The epiphytes benefit from shade during the hotter months of the year, and may be stood outside the greenhouse provided no frosts are forecast. Cacti kept in windows of the house must be where they can get the maximum amount of light and they will not flower well unless they can get a fair amount of sunshine. Most cacti flower in spring, summer or autumn, and it will be found that many flower on new growth only. If the flowers are pollinated many colorful seed pods can be formed. On the mammillarias these pods can look very attractive. Cacti are very suitable for miniature gardens. The bowl need not have drainage holes provided it is not overwatered. Place some crocks in the bottom and only half fill with a porous soil. When the plants are in position the rest of the soil may be added and firmed. If the soil under a flat stone, pressed into the top of the soil, is damp do not water. If cacti are grown well they suffer little disease but there are a few pests which may attack a sick plant. The most frequent one is mealy bug. This appears in a small tuft of wool or powder. Scale may also attack some cacti and looks like a small scab. Red spider may be a nuisance if the atmosphere is too dry. All these pests can be killed with malathion, used as directed on the bottle. Choosing cacti Many species of cacti from the following genera grow well on a window ledge. chamaecereus, echinopsis, epiphyllum, gymnocalycium, lobivia, mammillaria, notocactus, opuntia, rebutia and zygocactus. A few of the smaller types of cereus can be grown and Cleistocactus strausii will also grow for many years before it gets too large. The dwarf types of opuntias, such as Opuntia microdasys, too will be suitable. For planting in bowl gardens any of the small plants of the above genera will be a good choice but not the epiphyllums unless they are very small. If any of the plants grow too large for the bowl they can be removed and replaced by a smaller specimen. A suitable collection in a bowl can last for many years without it being necessary to change any plant.